It is our 8th time joining the Honolulu Festival. We believe that the Aloha Spirit is very important in dancing hula, which we enjoy from the bottom of our heart. Please come see us and show your Aloha Spirit! 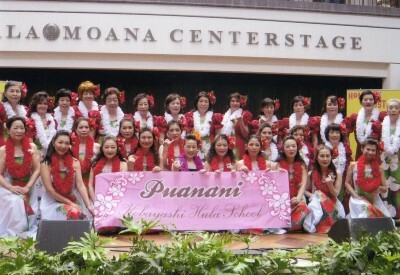 It has been 15 years since Puanani Kobayashi Hula school was founded in Nagoya. We are practicing everyday with beautiful hearts like flower Puanani and with Aloha spirit. Once again our entire group consists of energetic and cheerful ladies who love Hawaii and hula. We cherish the aloha spirit and enjoy practicing hula. It is an honor and a blessing to be able to dance hula in Hawaii, the place of its origin. Our school has fifty studios in the Nagoya and Gifu regions. 42 of our students will be participating in the 17th Annual Honolulu Festival. We have practiced diligently in Japan for today. We will dance joyfully and energetically. Please cheer for us. We are practicing and enjoying hula regularly at 30 studios mainly located in the Nagoya area. All 400 students love Hawaii and hula. Puanani Kobayashi Hula School most values the “Aloha Spirit”. Our goal is to dance hula with “heart of Aloha”.